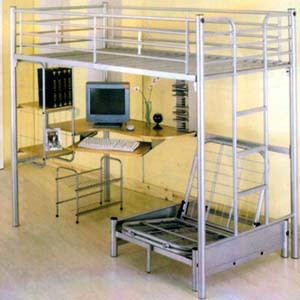 Computer Station Twin Loft-Bed With Keyboard Drawer, CD Rack and Book Shelves, In Satin-Silver Finish. The Futon Chair 4029(ML) (Not Included In The Price) Convertible To A Bed For Sleep-Over Friend. Mattress Not Included In The Price. Easy To Assemble. Futon Chair Size: Approx. 78.2 In. (L) x 32 In.(W). Loft Size: 78.5 In. (L) x 42 In. (W) x 72 In. (H). The Weight Capacity Of The Bed is 275 lbs. Bed, Box Wt: 200 lbs. Futon Chair Wt: 50 lbs. Futon Chair Mattress Wt. : 30 lbs.